We live in either Sunset Western Garden zone 15 or 16 in North Monterey County Ca. Zip code is 93907 but do not live in Salinas, but in Prunedale. We are trying to decide when to prune our plants. We have essently no rain from May to September, maybe a little in March and October. The plants are on drip. In Prunedale the spring growing season can start in February, or at least by mid March. 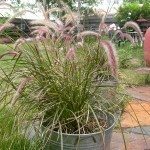 So you can prune back the fountain grass in early to mid- February before it starts to actively grow.